3 years ago we took in my Mom's dog, an S&P mini, Buddy. It was an easy transition being a family dog and all. In my wife and I's 25 years of marriage, we had never had a pet before. He was a joyous and welcome addition to our family. To me he was more than just a pet. He truly was a member of the family. 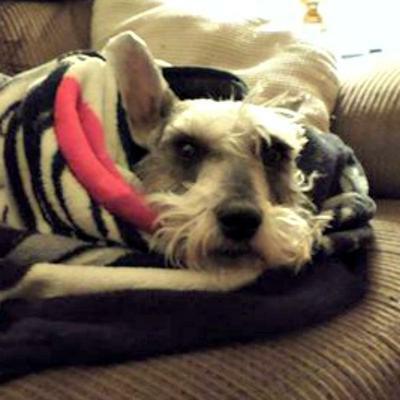 I suffered a serious neck injury last year that kept me confined to our couch for many months. When I was having the hardest times, he seemed to sense my dismay, and he would cuddle up right next to me. He was always there for me when I needed comforting the most. I was able to return the favor early this morning. I was there for him when he needed me the most. I was holding him as he was euthanized. He was suffering from a rare blood disorder that was shutting down his organs. He went very quietly and peacefully. Not only was he our beloved pet, he was my friend, my protector, my playmate, and truly my buddy. I am having trouble contemplating the coming days, with such a hole in our hearts and lives. The house seemed too quiet and too still this morning. I kept looking around to see him in his "hidey hole", or on his favorite chair. But he wasn't there. Now we will have to actually throw our water bottles away, instead of giving them to Buddy to chew on. We still have our beloved 6 year-old black mini, Maddie, to love and behold. The poor girl seems so confused at times. She is looking for Buddy we think. We will have to be careful not to forget about her, while we remember Buddy. She has been getting all the extra attention and love that we can give her. Buddy will be missed terribly. We will miss his quirks, his personality, his actual smiles, his singing of the Schnauzer song and just his overall Schnauzerness...everything. Our grief is overwhelming at this time. If there is a doggie Heaven, I'm certain that he is there sniffin' butts and wading in a sea of plastic water bottles. Goodbye Buddy, I love you...You will always be loved and remembered. Oh Kevin, we are so, so sorry to hear of Buddy's passing. We have enjoyed reading about him, what a little character. Nothing will lever replace the little chap, but hang on to those precious memories. It is funny what you say about the plastic water bottles - Max is the same, he goes mad for them - and makes such a noise!